Physical changes: You have a beeeautiful bald spot on the back of your head that I actually find hilarious. It gives you a mushroom cut/mullet style and let's just say that combo is attractive to say the least! You really are all business in the front and party in the back Rem. Rockin' it! Eating and sleeping: You have officially weaned yourself and strictly take my milk from a bottle. I find that 100% okay considering how convenient it is to not have to be the only one feeding you and I know how much you ingest. Starting solids has been smooth and fun too! As far as sleep goes, we almost have you sleeping through the night again. Almost. You learn fast though so I'm not worried about waking up to give you a quick kiss at dawn when you go right back to bed after until 10AM. You may be a night owl like us which I don't mind but either way, I lucked out BIG time in this department. 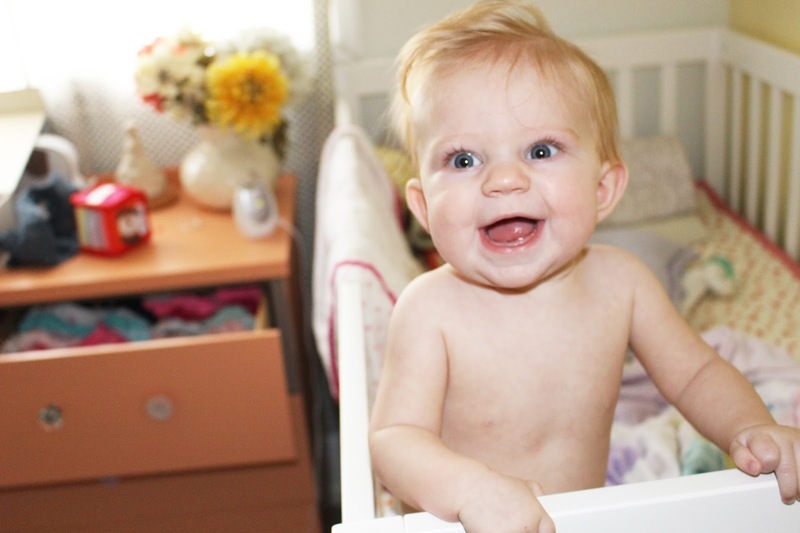 New habits, talents, and accomplishments: Oh man, you are a crazy baby now! Army crawling, "baby yoga" as we like to call your silly positions, sticking out your tongue and saying "buh", grabbing anything and everything that is in front of you, putting said things straight to your mouth, rolling like it's your day job, jumping in your exer-saucer, and also rocking back and forth on all fours have kind of freaked me out. Sloooow down baby girl! New places visited and new experiences: A lot of sports - football, basketball, and volleyball! We are Austy's #1 fans these days and you adjust well to the noise so far. Went to Edmonton for Thanksgiving. We tried Hollywood Babes where you take your babies to the movies. That was so liberating and fun! I really wanted to see the Giver too so thanks Movie Mill. Favorite things and activities: You are an unofficial mobile monster. Can that be a thing? In short you just like to be on the go. I love holding your hands and walking with you as you put one tiny little foot in front of the other. You have been doing that for moooonths now and I have come to the realization that you are going to be a mover. Bring it on! You love anything minky. Foo Foo (aka your bunny), blankets, your lamby soother? They are your go-to for cuddle time. I don't blame you, I try to jump in on those cuddles any chance I can get because they look so dang comfy! Not a big fan of: Hmmmm probably when I don't give you what you're reaching for or I hold you tight when you want to be free. We are still figuring out the confines of the carseat here and there. You are just crabby when you're sleepy and hungry but other than that you are a dream! Pretty easy peasy to please. So happy. So smiley. So chill. Love Note: I can already tell you are a cheery bubbly little lady. Whenever someone describes you they use the words smiley, alert, and strong. You are a petite little thing and yes you are strong! Always pulling your weight around with all this standing and jumping. I think you got your observance from yo' daddy because you stare intently at people like you are following and know what they are saying. You're a fast learner and it's fun to watch! I know you will have rough patches but if you're as sweet as you have been the past half a year, I will be one lucky mama! Jennica, Kate Beazer and I all went to The giver for Hollywood babes too. Wish we had known you were there! And I can't believe remi is army crawling and from the looks of the picture standing up in her crib by herself. What a big girl!